A PR is basically a driver without the magnet or coil assembly. It will have a means whereby additional mass can be added, usually via a threaded rod attached to the cone. The easiest way to understand how they work is to imagine the air in a ported enclosure as a spring, which pushes against the "slug" of air in the port. If you replace the port with a passive radiator that has the same mass as the air in the port, the tuning will be the same. To prevent over-excursion of the passive radiator, it is recommended that you have twice the displacement of the driver. For example a 10 inch driver would require a pair of 10 inch PRs with the same excursion, or a 12 incher with higher excursion. Faster rolloff may require a high-pass filter that an equivalent ported system might just scrape by without. First design the system using a port. Calculate the volume of air contained in the port. Multiply by the air density to get the mass. This is the amount of mass that will need to be added to the passive radiator. A simpler way is to use a design package that supports PRs. WinISD pro can do this, and is used in the following example. When fine-tuning a PR system, temporarilly mount the PR back to front so the weights can be easilly changed from outside the box. I have a few drivers that have been cooked, so I decided to convert them into PR's. This photo shows a 10inch driver with the magnet assembly cut off. The edge of the basket is cleaned up by adding some silver plastic automotive door trim. 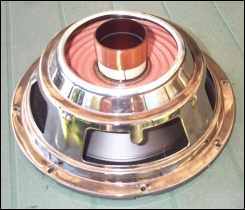 An MDF disk will be epoxied into the voice coil former, and a bolt through the disk will allow weights to be added. The designs were entered into WinISD and the results are shown in the following screenshots. The amp is the 80W Jaycar AMP with 4dB boost @ 35hz and the box volume is 50 litres. When entering the PR details into WinISD, use the T/S parameters from the normal driver. You will need to enter Vas Qms Fs Sd and Xmax - none of which are altered by removing the magnet. You also enter the number of PRs and the mass added to each cone. As you change the mass, you can see the change in the response. The snorky design has a pair of 86mm ports, 824mm long. Peak velocity is around 10 m/sec. According to Flare-it, a flare of 25mm radius is needed to be noise free. The two ports used in the Snorky design take up 10 litres, which can be saved by going to a PR design. The first PR design has a drop in output below 28hz - the PR design is 3.5dB down at 25hz. This would be noticable if being used for Home Theatre, but for music or HTIB (home theatre in a box) operation, it would be OK. In the second PR design, this is addressed, but at the expense of a few dB at 30hz. Its the old tradeoff between output and extension. This could be recovered by going to a larger box, but then ports would be a better way to go. Normally a twin PR design has the PR's on opposite sides of a cube, with the driver on the front. This allows any vibration from the PRs to cancel out. Since the performance is lower than the snorky design, something in return would be needed to procede on and build this design. All three units could be mounted facing forward which, with the cones all the same, would give the appearance of a tripple driver design.